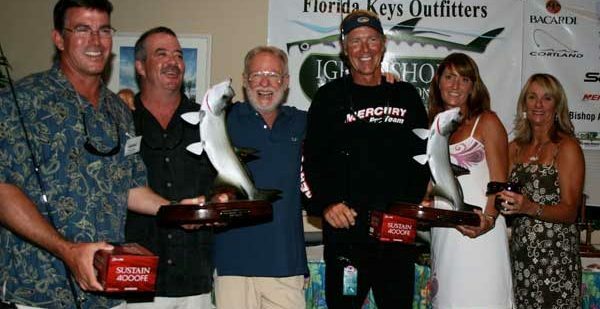 I’ve been an inshore Florida Keys fishing guide for many years and I’ve probably been asked every question possible so here is my current list with answers for you and if you want to know something that is not covered, just call or complete our Contact form. 2. Is it OK to just spin fish? Yes, certainly! 3. Do I need to be experienced? Not at all! 4. What will we fish for? 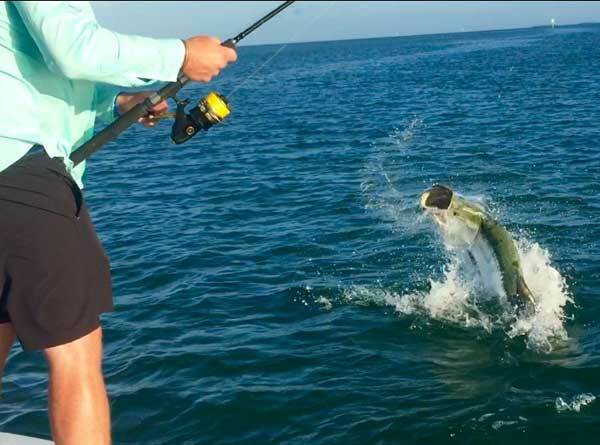 We can consider Tarpon, bonefish, permit, snook, trout, redfish and more. 6. What should I bring? Six important items. 7. 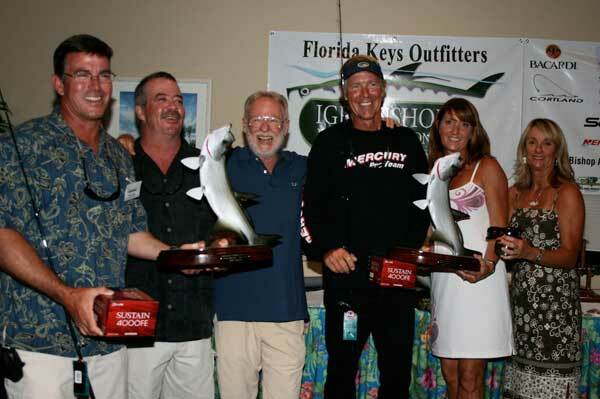 Are you experienced with fly anglers? Yes, it is my specialty. 8. Can I bring my own equipment? Certainly. 10. What can I expect to catch at different times during the year? Some fish are year round, others have seasons. 11. Where do I meet you? 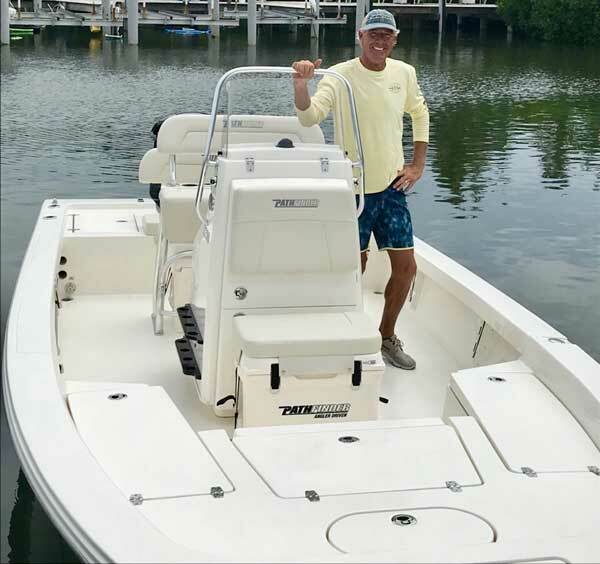 We’ll launch from World Wide Sportsman/Bass Pro Shop Bayside Marina in Islamorada or Flamingo in The Everglades National Park. 12. What are directions to the launch? A very easy drive from Miami and points north or easily up Overseas Highway from points south. 13. How do I recognize you? I’m tall and slim with graying blonde hair-In photo on right and in black Mercury shirt in photo below. 15. Do you have any support if I have special needs? I have leaning rails + full cage – watch my videos! 16. What about snacks, lunch and drinks? Bring your own to put in the cooler with ice provided. 17. Do I need a fishing license? No, as you have hired a Captain who is licensed. 18. Do you guide in tournaments? – Yes with many,many awards! 19. What does a trip cost? 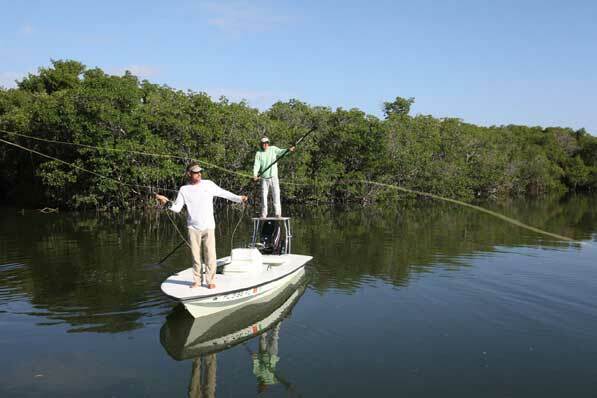 There are half,three-quarter and full 8-hr day trips: Skiff-Bayboat 2-angler Rates: $450-$500, $550-$600 & $650-$700. 20. Do you need a deposit? Yes – $200 per day. 21. How must I pay? Check, travelers cheques, Paypal email, wire transfer plus cash at charter. On short notice, credit cards are acceptable. 22. What if I have to cancel? Review our cancellation policy. 23. Am I supposed to tip? Yes, it is much appreciated! 24. Do you have any reviews or testimonials? Yes-including a celebrity video testimonial. 25. Is there a bathroom on the boat? No – but one is usually close by.